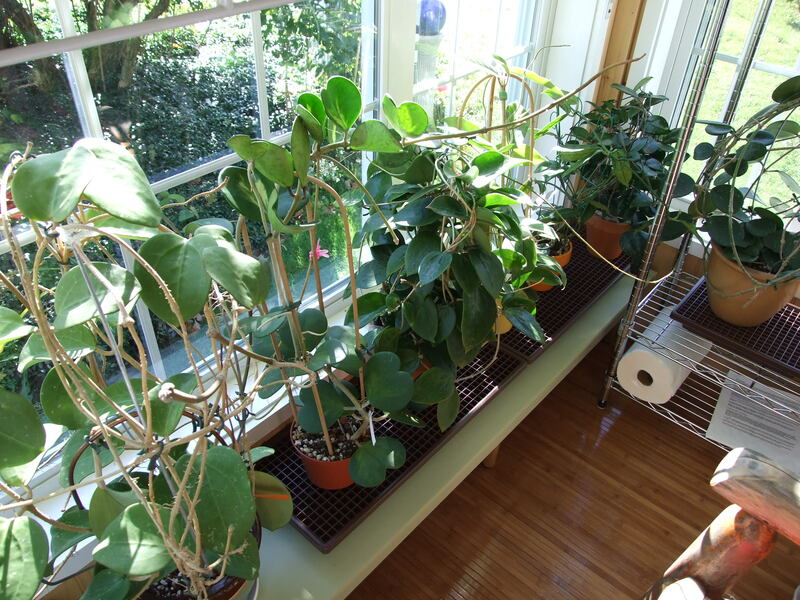 Watering is one of the hardest parts to figure out when growing Hoyas. In this section, I will give you some general guidelines, but I urge you to look at each plant’s individual entry for specifics. If it is cool water sparingly – It is far easier to make a mistake with overwatering when it is cool than when it is warm. Push that finger down in – Check for dampness with a dry finger, and push it in as far as possible. Most Hoyas won’t need to be watered more than every six days. 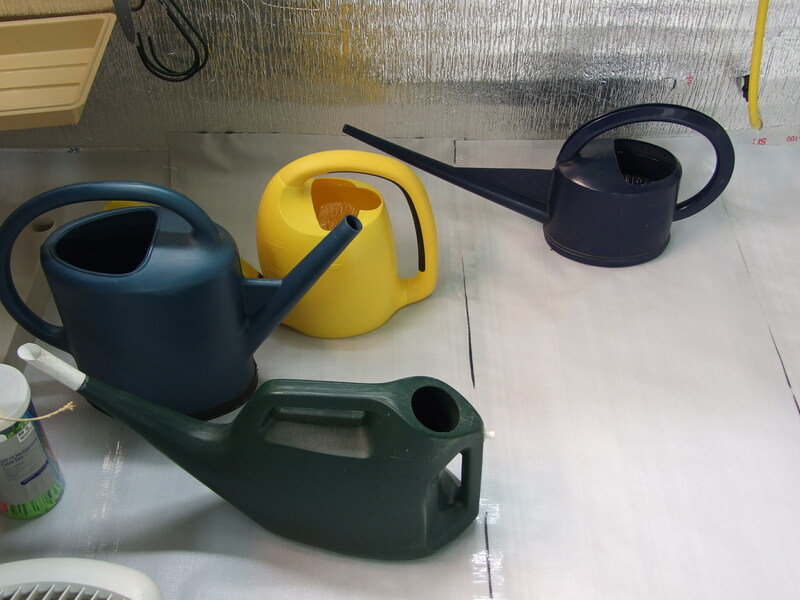 Heft that pot – Know what your pot weighs dry and wet. I find that most times I can very accurately judge when to water a plant just by picking it up. Water through – Don’t water in sips; when it is time to water soak the plant and water through. The easiest way to do this is to grow on a grid in a tray, or water in a sink. If you are watering in a saucer, don’t forget to empty out the flow through water. 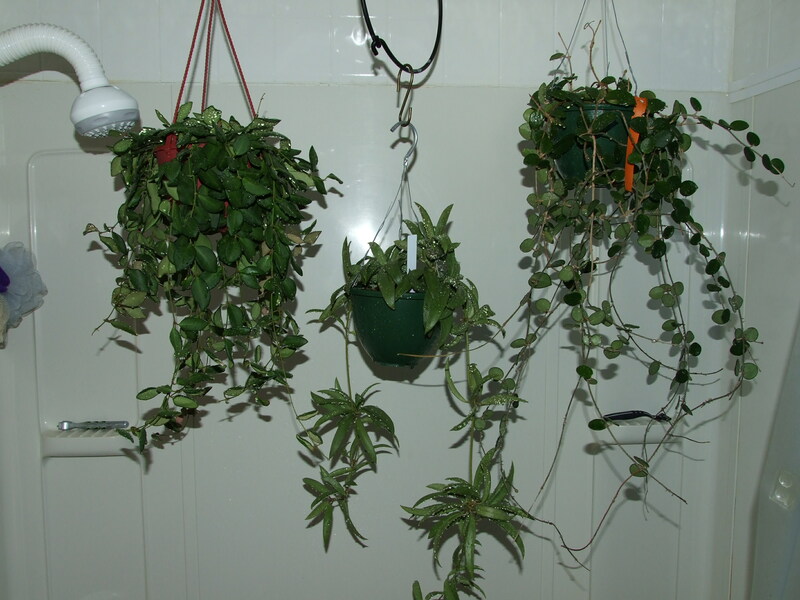 Give your plant a shower – Periodically give your plant a shower. This task accomplishes two things: It washes off accumulated dust on the leaves, and washes away any build up of fertilizer salts. It will make your plants shine, and they will thank you for it. You just might water more in the Winter – Although this statement might seem at odds with rule number one, it is not when one considers the dry atmosphere of the modern centrally heated house. The Sahara like conditions in a heated home when it is below zero outside can draw the moisture right out of a potted plant in a hurry. I have heard some nasty arguments on this subject. I will only stress that I use a well balanced fertilizer, and I believe that there are many good ones out there. I do not stop fertilizing in the winter; I fertilize at 50%. Plants grown in soiless mediums need to be fertilized at most waterings. It is only when I realized this fact, that my Hoya growth really took off. If you really want these things to grow, they need to be fed! This is also another reason to water through every time, as it will help minimize any build up of salts in the medium.